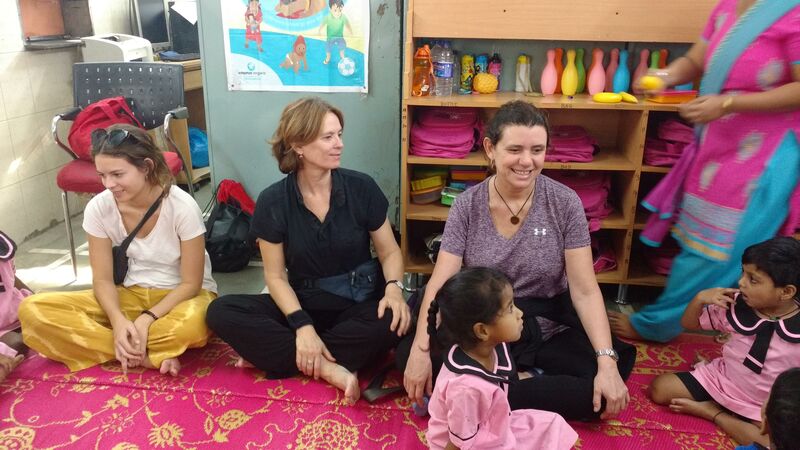 Irene and her friend Alicia with her daughter Eva visited the preschool centres in Ghatkopar and Govandi on 31st December, 2018 to spend ‘’Nochevieja – The Old Night ’’, meaning New Year’s Eve in Spanish. How best to celebrate New Year’s Eve? By visiting happy carefree tiny tots enjoying their childhood playing and learning with their peers! Irene and her friend Alicia with her daughter Eva visited the preschool centres in Ghatkopar and Govandi on 31st December, 2018 to spend ‘’Nochevieja – The Old Night ’’, meaning New Year’s Eve in Spanish. Eager to visit Mumbai Smiles Foundation and witness the organization’s work, Irene and her friends were extremely delighted to interact with project staff, beneficiaries and their families. Our visitors participated in yoga and other activities with the teachers and children at the preschools. Alicia congratulated us for all the work we were doing and specifically thanked Komal for explaining the projects’ role and objective to them. Overwhelmed with all the love and hospitality shown by the families Eva expressed her willingness to contribute and help us soon! We look forward to another visit from Irene, Alicia and Eva. Previous PostPromoting team spirit and physical activity through Sports!